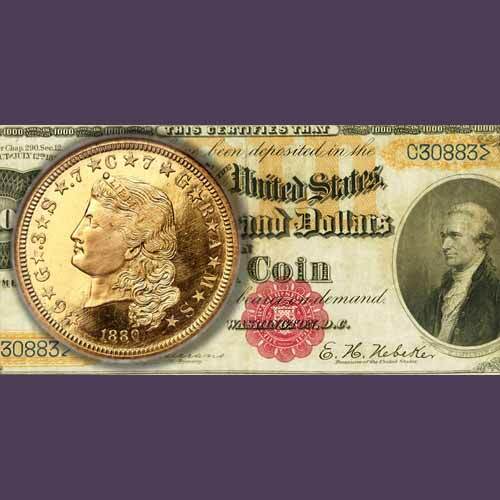 A late 19th century U.S. coin and a U.S. gold certificate certified by NGC and PMG respectively were offered by Heritage Auctions at the FUN show recently. Four World War I notes from German New Guinea, certified by PMG, were also offered. An 1880 Flowing Hair $4, graded NGC PF 67 Cameo, was sold for $750,000 at the FUN US Coins Signature Auction held on 4th January. Just 20 such examples exist. They were issued only in proof and only in 1879 and 1880, making them desirable among collectors. At the same event, an 1879 Flowing Hair $4, graded NGC PF 67 Cameo, was sold for $312,000. It is not as rare as the above-mentioned coin. However, it is the finest of its type and date. An 1879 Flowing Hair $4, graded NGC PF 66 STAR Ultra Cameo was sold for $240,000. An 1856-O $20, graded NGC AU 50, was sold for $288,000. It is the rarest gold coin from New Orleans Mint. Only 11 such coins exist. A 1943 bronze cent graded NGC MS 61 BN and a 1943-S bronze cent graded NGC AU 53 BN sold for $180,000 and $228,000, respectively. Since copper was needed during the war, every 1943 cent, except for a few errors, was struck in steel. Bronze coins of this type are extremely rare. An Original 1915 Panama-Pacific Double Set was sold for $550,021. The coins were issued to commemorate the inauguration of Panama Canal. Silver Half dollar, a gold dollar, a gold quarter eagle, a round gold $50 and an octagonal gold $50 were issued. A 1915-S Round Panama-Pacific Gold $50, graded NGC MS 66, was sold for $192,000 and a 1915-S Octagonal Panama-Pacific Gold $50, graded NGC MS 65, was sold for $138,000. The original case sold for $18,000. An extremely rare 1882 $1,000 Gold Certificate, graded PMG 30 Very Fine, sold for $600,000 at the FUN Currency Signature Auction on 5th January. Signature of Rosecrans and Nebeker shows that the note was issued in the early 1890s. There are only five known examples of this note. Two 1934 $10,000 Federal Reserve Notes, Fr. 2231-B, one graded PMG 64 Choice Uncirculated and the other graded PMG 63 Choice Uncirculated, sold for $132,000 and $114,000, respectively. They belonged to a $1 million display of $10,000 notes at Binion’s Horseshoe casino in Las Vegas. Four rare German New Guinea Notes from the Australian occupation during World War I, were sold for $168,000 at the FUN World Currency Signature Auction on 4th January. Written dates of October 14 or November 5 appear on the cancelled notes. They are graded PMG 45 Choice Extremely Fine, PMG 53 About Uncirculated, and PMG 35 Choice Very Fine.